Caribbeans are built in chilly Melbourne, but they speak to the souls of Western Australians: their cockpits are huge, and that of the 2400 Hardtop is no exception. Having a towing-unfriendly 2.69m beam helps here but, if unrestricted towing is a necessity, it takes an expert to pick the difference from the new model 2300 (it’s on show at Mandurah) that has a free and easy 2.5m beam. 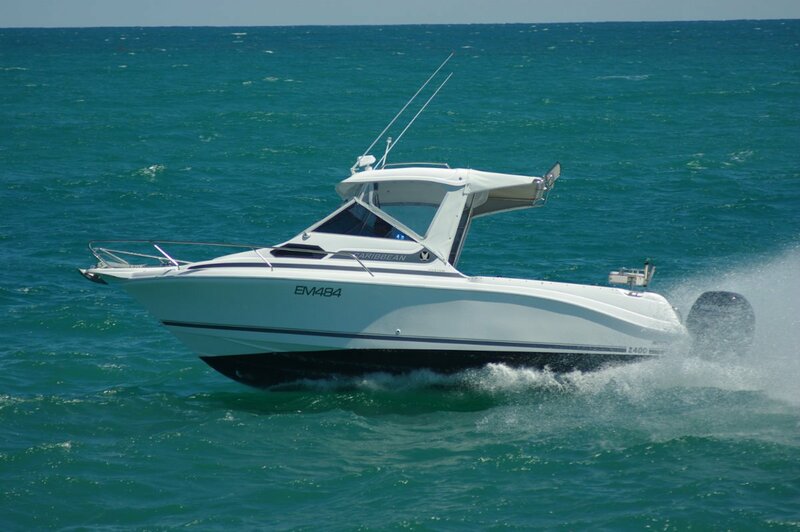 The review 2400 had received customising attention from the local agents who are also shipwrights. The buyer is exceptionally tall and had not been able to find a boat he could stand up straight in, so the Mansfield brothers raised the hardtop. This automatically converted the closed hardtop into an open one – a style a lot of people prefer. 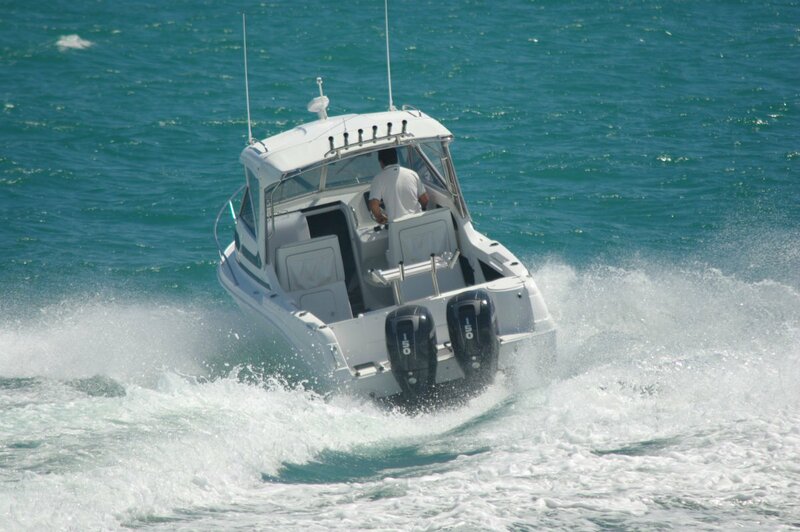 The 2400 is the active person’s boat but still has its share of comforts. There is a genuine flushing toilet in the fore cabin, and goodies under the two main seats: a vast ice box under the driver, and a sink below the navigator that in turn sits on a locker. The seats themselves are in the luxury class – large, well padded, and equipped with footrests attached to the seat boxes, the position that usually works best. Vision through the toughened glass windscreen is first class. The cabin has the usual V-berths that convert into a hedonist’s double bed, and is closed off by an effective sliding door. The fore hatch is unusually large making for easy rope handling; ropes get a dedicated foredeck locker. 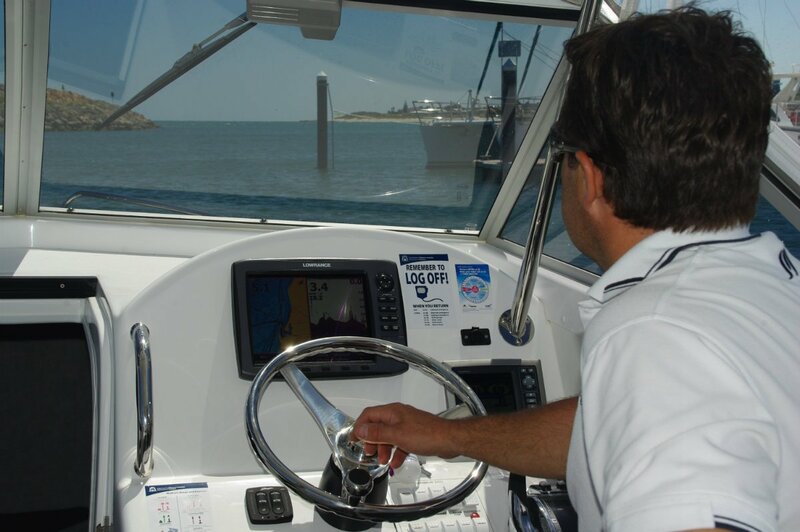 Anchoring is handled by a power windlass and has the extra security of an all-chain cable. The hardtop is double skinned, which allowed a console to be moulded into it. 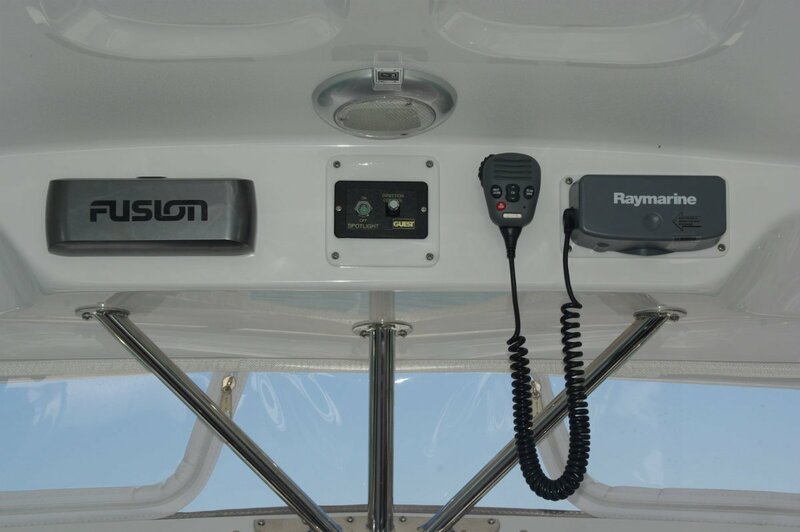 A lot of secondary items have been moved up there leaving plenty of dash space for the all-Raymarine electronics and the motor monitors. Extra bracing was installed when the roof was raised, providing informal hand holds for driver and passenger. Three more passengers can fit onto the folding lounge aft. With this folded there is more than enough room for all five to fish. 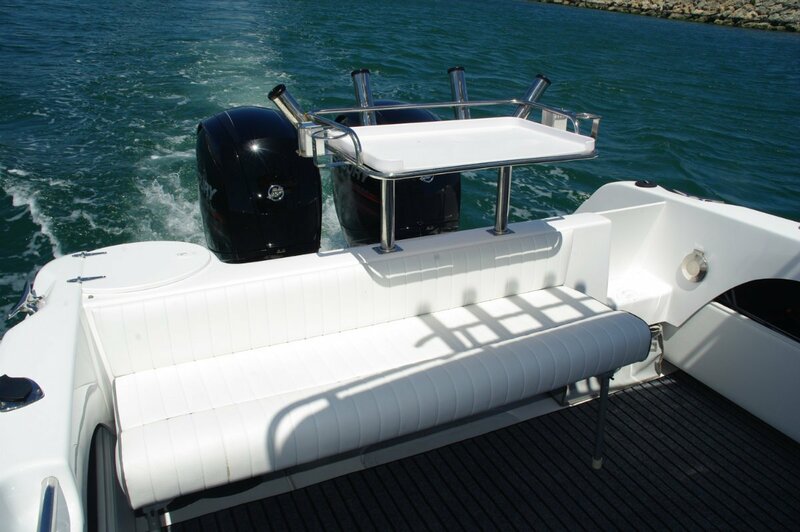 Racks in the side pockets plus coaming sockets installed to suit the owner will easily accommodate their rods. Side pockets on several levels add up to a lot of storage space. More dedicated storage is available in the two under deck lockers. Caribbeans are usually finished locally with extras to suit the owner. 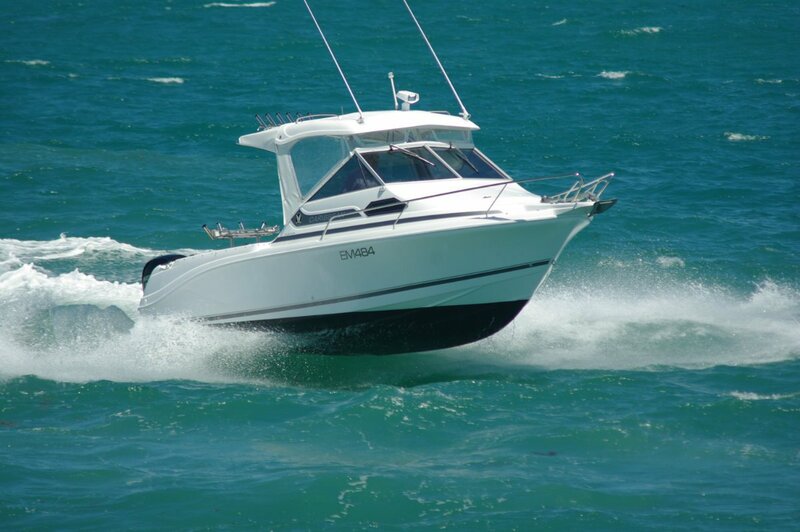 Ours had extra side cleats, trim tabs, underwater lights, a remotely controlled spotlight, a bait board and a four-speaker stereo with ipod docking. 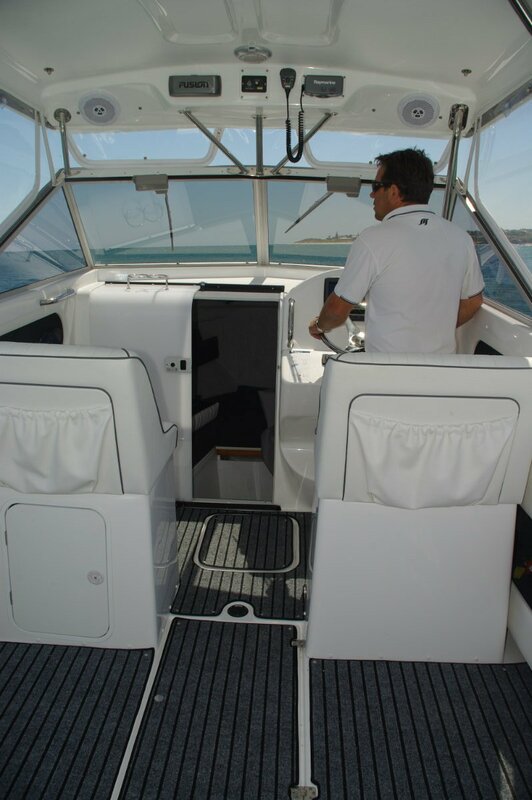 The hardtop had a cantilevered soft extension about half way to the transom, but actual length is the owner’s decision. Power came from a pair of 150hp Mercury four-strokes. Simpler than the Verado, with no supercharger or electronic controls, these motors push out a lot of grunt from a full three litres. An option, which has just become available, is a 265hp diesel sterndrive – and some diesel it is. 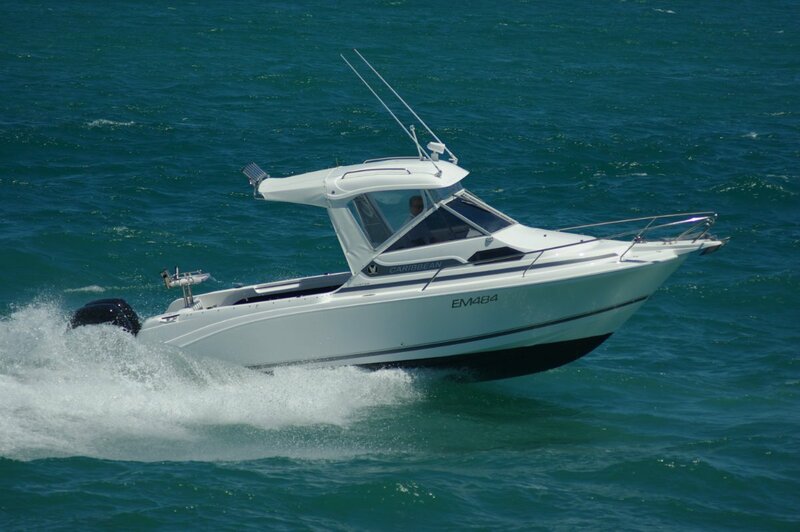 Nominally a Mercruiser, it is essentially the V6 from the VW Touareg. Coupled with the 2400’s 450L fuel capacity, it should deliver the kind of range a lot of people who fish northern waters would like. Our spring day provided a 20 to 25-knot gradient wind with seas to match. Not the sort of day you would choose for boating, but just the conditions that Caribbeans are designed to absorb. 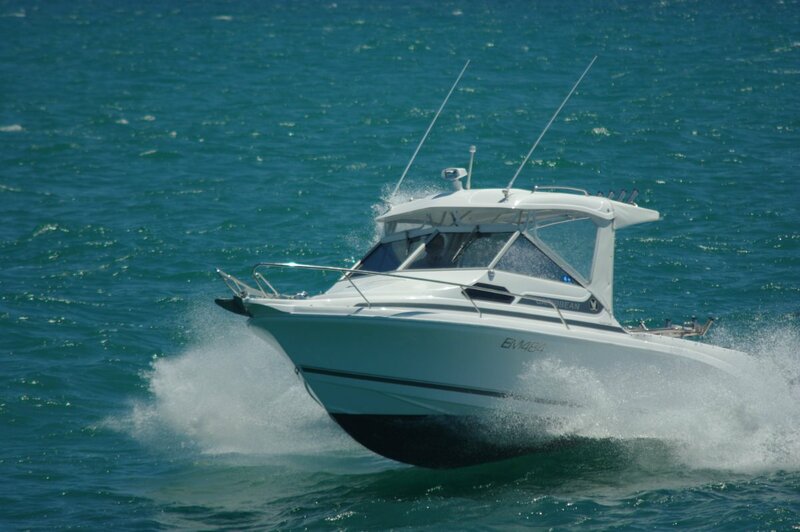 Ride was as good as expected, the 2400 behaving like a larger boat. There was plenty of movement of course, giving the hull a chance to demonstrate its rigidity: not a creak, groan or rattle. With legs trimmed in 20 knots into the seas caused no pain; downwind we (briefly) reached 42 knots. And it was all effortless; the excellent seats, the good driving position, the hydraulic steering all contributed. Especially the last: the whole experience would have been spoiled by twin motors with cable steering. With a single outboard and basic equipment the 2400 costs $120,000 on a trailer; with the diesel option that rises to $135,000. The review boat with custom work, extras and twin motors was $142,000.